Faith and Dr. Mirage have traveled to the Deadside to find the soul of Animala in Faith: Dreamside #3. When Faith and Dr. Mirage arrive in the Deadside, they find themselves in a world that looks like it came from both Disney and The Wizard of Oz. Faith and Dr. Mirage have traveled to the Deadside to find the soul of Animala in Faith: Dreamside #3. 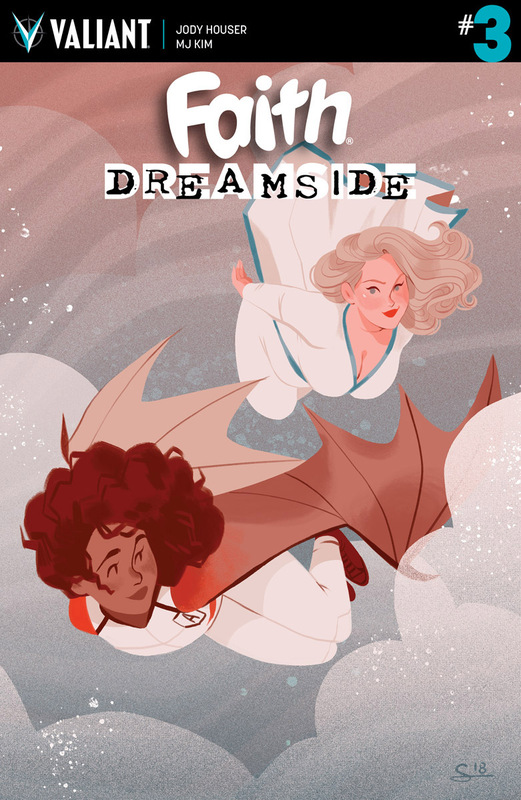 When Faith and Dr. Mirage arrive in the Deadside, they find themselves in a world that looks like it came from both Disney and The Wizard of Oz. They are also guided by Dr. Mirage’s dead husband and a dead clone of Faith. While on their journey, Faith contemplates on whether or not she should retire as a superhero. When they get to where they are going to, they encounter the ruler of this version of the Deadside and all hell breaks loose. The story from Jody Houser is smart and is fun. One of the highlights is the interaction between Faith and Dr. Mirage as they make their way through the Deadside. It was fun to see Faith react to her surroundings. She asks the questions that we would ask in this situation. It’s solid comic relief and helps propel the story along even more. All of these elements show how strong of a writer Houser is and how she can deliver a story that has personal stakes but is fun. MJ Kim once again delivers with the art and it is my favorite part of the book. Every panel is gorgeous and sets the tone of the story. My favorite panel comes towards the beginning of the book where Faith and Dr. Mirage are walking. The background is bright and happy where the foreground shows the true death and decay of the Deadside. I thought that this was a unique touch and only drives the stakes of the story further. I am looking forward to seeing what Kim does in the final issue of this series. The one negative thing to take away from this book would be that the villain isn’t well established. I felt that he was lacking and did not seem as menacing as he should be. I know this story is about saving Animala and bringing her back but I would have liked to see the villain do more and influence the story more. If this is my one negative takeaway, I think the finale will still be fine. This is one of my favorite miniseries in a while and I look forward to seeing how it ends.